Discover the city of art and lights with reliable car rental service! Complete the search form now and make your trip a memorable event with car rental Aix-en-Provence! Car rental Aix-en-Provence offers a wide choice of car rental deals to suite any purposes and your car hire budget. You can amend or cancel your car rental reservation online quickly and easily with our easy booking procedure. Forget about all the automobile stuff as it’s time to experience what the real essence of reliability and comfortable drive is with car rental Aix-en-Provence! 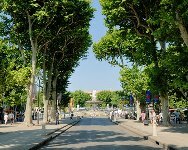 Arrange the desirable Aix-en-Provence car rental location and check Must Know and Places to Visit with car rental Aix-en-Provence! Aix-en-Provence is a charming city that for centuries has been the cultural center of Provence. Thirty kilometers separate Aix-en-Provence from Marseille and the Mediterranean Sea. Aix-en-Provence is a lively, vibrant city with cinemas, discos, restaurants and shops. The city has preserved its rich historical and cultural heritage: the picturesque ancient streets and squares, aristocratic mansions with elegant facades, numerous palaces of the XVII-XVIII centuries Provence nobility, mostly in the Italian Baroque style. With its history, traditions and unique richness of architecture Aix-en-Provence is a real open-air museum, a real time travel to the thriving "noble" Provence of XVII-XVIII centuries. 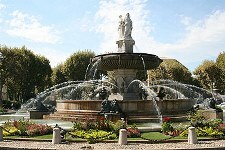 Aix-en-Provence is known for its numerous fountains. When you get your car rental vehicle have a city tour to see several hundreds of fountains. The largest and most famous one is on the Cours Mirabeau, the main avenue through town, as well as a moss-covered fountain which draws its water from a hot spring. French painter, one of the largest representatives of the Post-Impressionism Paul Cezanne was born in Aix-en-Provence. 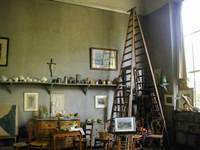 In 1954 he established a small museum where still lives, a collection of household items that accompanied the artist in his daily life are exhibited. Get your car rental vehicle and come to enjoy the art of the famous painter! The museum has existed since 1930. It introduces the history and customs of the city. There is a collection of traditional clothes of the Aix residents, pieces of furniture, pottery, and two varieties of wooden puppets – some were usually hung over cribs, others were used during the celebration of the day of Corpus Christi, which was widely popular at the beginning of 20th century. 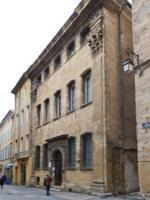 Get acquainted with Aix-en-Provence by visiting the museum using your car rental vehicle. RentalCars24h.com offers you reliable car rental Aix-en-Provence services that will help you to feel free and independent when moving around the town. 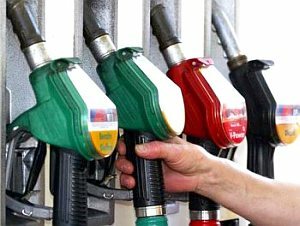 Providing best online prices for car hire Aix-en-Provence services, RentalCars24h.com allows you to save money each time when you rent a car in Aix-en-Provence.